With the increasing cost of health care, many people, myself and my wife included, have turned to a cheaper health care provider. His name is Dr. Google. He's a close associate of our backup Dr. (aka Doctor on call) who goes by the name of Web MD. He has no last name, which I think is odd, but if it works for Cher and Bono, why not a doctor. The other day when our dog Toby started limping around the house, holding his back leg up at times and favoring it, we did what any modern day pet owner would do first. A few key strokes and a couple of mouse clicks and the good Doctor had a diagnosis for me as well as a cost estimate. He was pretty certain it was a torn ACL on Toby's leg with nothing short of a $2500 surgery to fix it. This was not good news as a pet owner. Bad Dr. Google! As we paid more attention to Toby for the next day or so, we noticed he had gunk in his ears. Not sure what to think of it, we dialed up Doctor Google again and once again, he was quick to give us a diagnosis. He was convinced it was ear mites which are contagious between pets. Having two other cats, we feared the worst. After checking both of them, we saw they were clean, so we were relieved. At this point we sought professional help. A real vet. 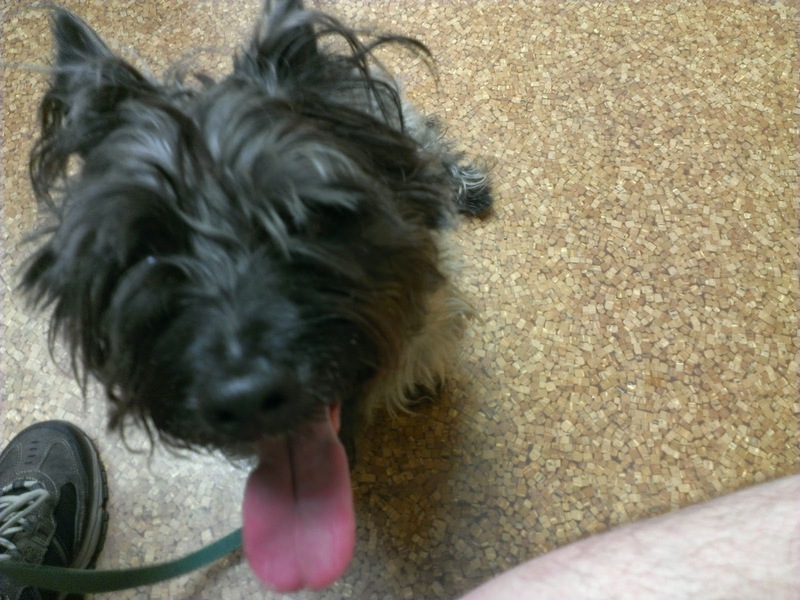 We did with great apprehension because vet bills can get out of hand in a hurry. (Yes, I'm aware that is part of pet ownership, I get that.) But in part because we weren't getting the answers we wanted from Dr. Google, we thought we had nothing to lose. The first thing the real doctor (Dr. Kevin) did was prescribe Toby a sedative so that he'd be calmer when we took him in. Needless to say the sedation didn't work. Well, actually it did, but not until 3 hours after we got home. Toby looked like he wanted some Doritos and a little Pink Floyd. There were times he stood up and it seemed like he forgot he had back legs. He was kind of doing handstands across the living room floor. He didn't realize he'd been "roofied" three hours earlier. The doctor proved our Google diagnoses were wrong on all accounts. He thought the leg was just a strain and so prescribed anti inflammatories. Then, when he checked the ear gunk under the microscope he didn't find any sign of mites. Just bacteria and yeast. (Yuck!) Wrong again, Dr. Google. And finally when he checked out a lump that we had felt in Toby's side, he said it was just a fatty tumor. Not a cancerous growth that I had self diagnosed without the help of Dr. Google. Both my wife and I have done similar online diagnosing using Web MD and quite often, after we see a real doctor, those diagnoses are also proven wrong. So what doesn't work for pets, carries over to humans as well. There are cases where given the symptoms you have will get you clued in to what the problem MIGHT be. But many times, it also gives you 2 million hits of what it might not be, which if taken the wrong way can create all kinds of false anxiety. In short, the lesson here is, if you want to fix your dishwasher or learn how to do a brake job, Google and YouTube are great things. If you're trying to splint up a fracture or stitch up a bad cut using fishing line and a latch hook, you might want to dial 911 before Googling.